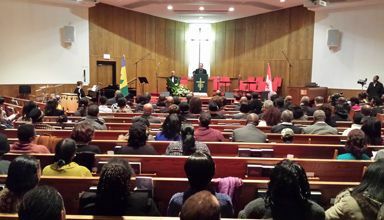 The St Vincent and the Grenadines Ad Hoc Relief Committee, which consists of leaders from the Diaspora Groups in Toronto organized the service under the auspices of the Consulate of St Vincent and the Grenadines to remember Jamal Edwards, Jamalie Edwards, Glenroy Michael, Anique Alexander and Raquel Ashton. Simonique Ballantyne and Chanstacia Stay are still missing, presumed dead. The service started promptly at 4:30 pm in spite of the brutal winter weather and was conducted by Rev. Trudy White. Several religious ministers represented their religious denomination and officiated during the service. The homily was delivered by Rev. Alston E. Davy and the Benediction by Rev Raymond Burnett. After the rendition of the anthems of Canada and St Vincent and the Grenadines, Honorary Consul Jose Bonadie read a very touching message from the Premier of Toronto, Katherine Wynne, who expressed her best wishes to the surviving students and condolences to the People of St Vincent and the Grenadines and the families of the fallen students. Consul General Fitzgerald Huggins delivered a very moving welcome address and gave a brief background of what transpired on that fatal morning of January 12, a review of the response efforts and an overview of the activities that the government has embarked on to make life more comfortable for the community of Fancy. Consuls General from Barbados, St Kitts/Nevis, St Lucia, Trinidad and Tobago, Guyana and Trade Ambassador from Dominica, Frances Delsol represented their countries in a massive show of support that was reminiscent of the sentiments shown by countries across the Caribbean and around the world. The youthful theme of the service was evident with seven youngsters each holding a candle while reading a scripture verse representing the themes Comfort, Peace, Rest, Suffering, Hope, Eternal Life and The Rapture. In a very moving tribute, each reader then presented a symbolic candle to be lit in memory of each one of the fallen children. Singing sensation, Kimya Hypolite, appropriately rendered Michael Jacksonâs âGone Too Soonâ and her brother Kwesi Hypolite played âHard To Say Goodbyeâ on steel pan. These renditions, along with a heartfelt gospel song by Sonia Sutton and Zarina Adams, clearly represented the solidarity of the Canada Diaspora as they came together to express their grief. The outpouring of support was also evident with the response received in the Offertory. The money collected will be used to offset the cost of the Memorial Service and the SVG Ad Hoc Committee has agreed to use the balance to assist the people of Fancy with a project befitting a Memorial for the tragedy. SVG Ad Hoc Committee member Renee Phillips delivered the Vote of Thanks to recognize all the persons who made the event a huge success that it was. The Committee is especially thankful to the Wesley Chapel Free Methodist Church for willingly agreeing to host the service.